How to enjoy your sprouts! This post is a follow-up to my recent post, “The Miracle of Sprouting,” where I discussed how sprouting works, the amazing nutritional benefits of sprouting, and six easy steps to making your own sprouts–quickly and cheaply! (Here’s one more nutritional fact, I couldn’t help myself 😉 : 1 oz. of broccoli sprouts have the same amount of antioxidants as 3 lbs. of broccoli! source). In this post, I will share some ideas of how you can enjoy your sprouts. At the end, I’ll tell you where you can buy seeds for all sorts of wonderful sprouts! Pop-’em: eat them plain, as a snack. 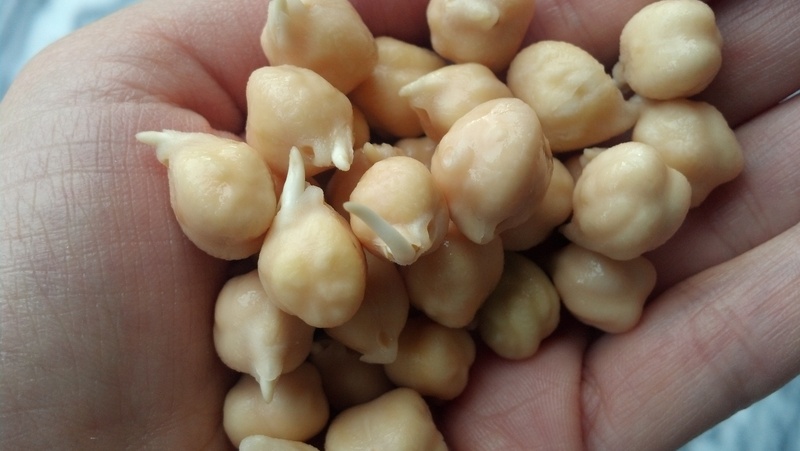 The bean sprouts–especially mung bean and chickpea–are crunchy, so kids will enjoy them, too. My daughter happily eats sprouts for any meal, including breakfast! She pops them in her mouth like candy. She enjoys them so much, I’ve started to hide my sprout jars because when she sees them on my counter, she demands to have some, even when they are not ready. Tell your kids they are like “nuts” or baby “puffs!” They won’t know that what they’re eating is essentially a multi-vitamin! Sprinkle them on top of a green salad for a crunchy, nutty addition. Make a sprout salad using one or more varieties with some salad dressing. This can be eaten as a salad course or a side dish. Use them as an ingredient in a sandwich or a burrito wrap, vegetarian or not. I especially enjoy them in a sandwich that also includes avocado, pepper, and/or carrot ribbons. Add them to your stir-fry, either while cooking, or just before serving, as a garnish. I recommend doing the latter, since cooking reduces the nutritional content of live foods. But, hey, that’s how some of you will enjoy eating them! If you prefer cooking them, I recommend adding them a minute or two before the stir-fry is done, so that they have the least exposure to high heat. Make sushi or spring rolls! I got this idea from Jennifer Cornbleet’s book, Raw Food Made Easy (a book my mom bought me when I barely new anything about raw-fooding!). There’s no real recipe for this, except that sushi requires nori sheets and spring rolls require a leaf to wrap up the ingredients (think: romaine, cabbage, green leaf, etc.). Along with your sprouts, you can add sliced avocado, sweet pepper, cucumber, carrot (grated or in ribbons), herbs (cilantro works great), scallions, and anything else you like. 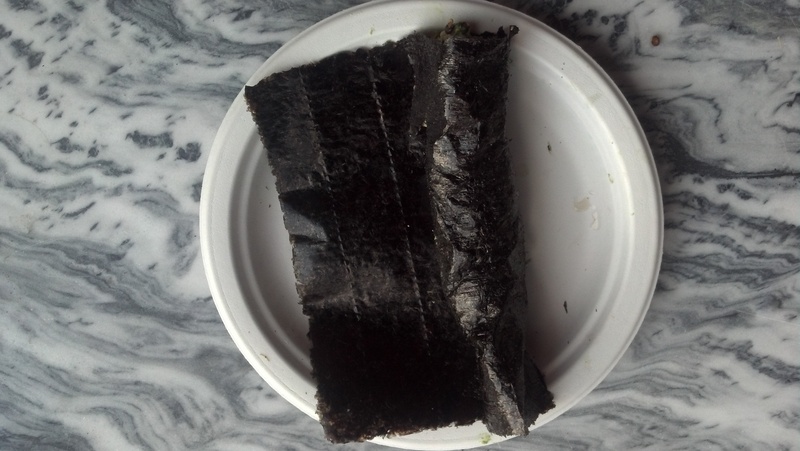 Layer your ingredients along the short end of the nori sheet, and roll toward the opposite end. Add a dressing or sauce–like teriyaki, soy/tamari, peanut, miso, carrot ginger, or anything else you enjoy–in the nori roll, or on the side for dipping. Don’t bother cutting the roll into pieces, because ingredients will fall out. Eat it like a hand roll. 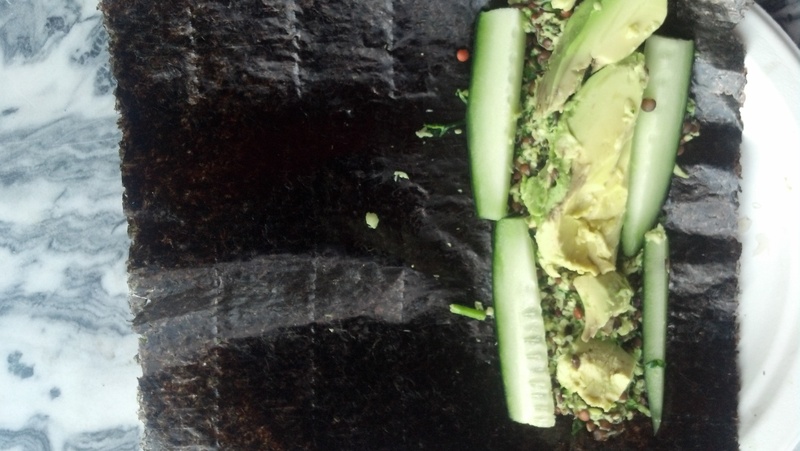 A few rolls make a tasty raw lunch! Ingredients placed on nori sheet, on short side. Make a pate or chumus out of your sprouts! Making a paté out of your spouts (or chumus, if it’s chickpeas), involves putting a few basic ingredients into your food processor, along with your sprouts: minced onion or garlic (or both), lemon juice, herbs of your choosing (cilantro and/or parsley are great choices), salt, seasoning (cumin is great for this, but also paprika, turmeric, cayenne pepper, curry etc.) and some olive oil. If you’re making chumus, then replace the olive oil with tahini. For exta flavor, you can also add in some say sauce/tamari/nama shoyu (all variations of the same thing). Experiment with different proportions and different herbs and spices! Make it your own! You really can’t go wrong, since you can always adjust the taste if it’s not quite right. If you’re not feeling quite daring just yet, here are recipes from the web to inspire you: Jennifer Cornbleet’s paté (sub in any legume for the walnuts) or Vegan Baker’s Raw Sprouted Chumus. I’d love to hear if you’ve used these ideas or if you have any new ones to add! Before I sign off: For those of you looking to expand your sprouting repertoire, the best site out there is sproutpeople.org. They sell seeds for leafy sprouts (clover, alfalfa), bean sprouts, broccoli and brassilica sprouts, exotic sprouts, and sprouting nuts and grains. For each type of sprout, they have specific instructions and some how-to videos. They also have sprout mixes that taste really great. And, finally, they have lots of “equipment” like sprouting jars and lids, as well as all sorts of sprouting devices. Mesh screen lids for sprouting jars, made by Sproutpeople. Image courtesy of Sproutpeople. Sproutpeople’s French mix (their most popular one): Clover, Arugula, Cress, Radish, Fenugreek, Dill. Image courtesy of Sproutpeople. Categories: Healthy-eating tips | Tags: chickpeas, lentils, mung beans, raw, sprouting, Sprouts, vegan recipes | Permalink.